Eliza Sproat Turner, one of the founders of the New Century Club, now the New Century Trust. The Philadelphia Area Consortium of Special Collections Libraries (PACSCL) gratefully acknowledges the generous support of the New Century Trust to enhance the website for its “In Her Own Right” initiative, showcasing the documentary history of women asserting their rights in the century leading up to the passing of the Nineteenth Amendment in 1920. The pilot website, http://inherownright.org/, features digital images of documents from a variety of Philadelphia archives — letters, meeting minutes, reports, diaries, photographs, and other materials — that shed light on women’s efforts to achieve emancipation, voting rights, property rights, access to education, legal parity with men, and more. Through digitally aggregating this wide range of materials, In Her Own Right facilitates broad accessibility and enables new kinds of research and interpretation in context. The pilot was supported by a Foundations grant from the National Endowment for the Humanities. PACSCL has recently received a $496,000 Digitizing Hidden Collections grant from the Council on Library and Information Resources to digitize another 117,000 pages of materials from eleven participating libraries, including four who did not participate in the pilot project. The grant from the New Century Trust will enable PACSCL to incorporate these new partners and to automate the process of aggregating material in the project database. Sly also noted that the next phase of the project, for which PACSCL is currently seeking funding, will include the digitization of a large number of New Century records, held at the Historical Society of Pennsylvania. Co-principal investigators on the In Her Own Right project also include Margaret Graham (Drexel University College of Medicine Legacy Center), Celia Caust-Ellenbogen (Friends Historical Library, Swarthmore College), and Caroline Hayden (Historical Society of Pennsylvania). Kathryn Antonelli, based at Temple University, serves as project archivist. The New Century Trust was founded in 1893 as the incorporated body of the New Century Working Woman’s Guild. 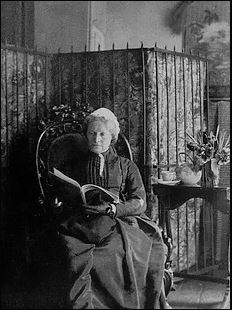 Eliza Sproat Turner (1826-1903), a progressive women’s activist, helped create both organizations. Over several decades, the trust oversaw and provided financial support for the guild’s activities for women in the workforce, such as evening classes and lectures. For many women, the guild provided a haven away from the stresses of work, a place where they could obtain low-cost meals, sleeping accommodations, and even emergency financial assistance. 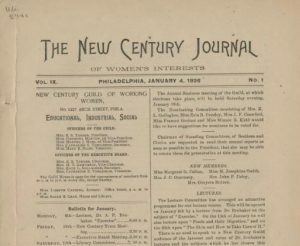 The New Century Journal, January 1896 edition, in the Historical Society of Pennsylvania collections. In 1887, the guild began publishing a newspaper written by and for members, the Journal of Women’s Work, which offered event calendars, advice columns, short stories, and poems. It also eventually formed its own library, gymnasium, and a variety of internal committees on which the members could serve. In 1895, the guild shortened its name to The New Century Guild and became a member of the Federation of Women’s Clubs of Pennsylvania. The thirty-eight member libraries and archives of the Philadelphia Area Consortium of Special Collections Libraries collect, care for, and share with a world-wide audience collections that comprise an internationally important body of unique materials for students, scholars and lifelong learners at any level. PACSCL promotes both a supportive special collections community and opportunities for members to leverage the power of collaborative work. It also encourages scholars, educators, and other diverse audiences to explore and engage with member institutions’ uniquely rich holdings.